There are certain types of movies that will always get an insta-watch from me. I love how screenwriters come up with these intricate plans of attack that have to be carried out by a select group of friends, each with their own strengths. These stories are always full of villains and red herrings, twists and turns, botches and foils, love and betrayal. It's storytelling at its absolute action-packed peak. So when I heard this book pitched as The Breakfast Club meets Oceans Eleven, I jumped on the chance to read it. I mean, come on. Incredible heist + unlikely friends? How could than not = literary perfection? Plus those cows on the cover. Cows are always a good sign, right? Knowing my excitement for this book was at an eleven already, I dove in with a smidge of reluctance just to prepare myself for a potential letdown. But by the first chapter, that wall had cracked and crumbled as if David Hasselhoff himself were on top belting out a song in a light-up jacket. This book had me. It owned me. I belonged to it. There was no way I was going to put it down because there was no way it could get any better. 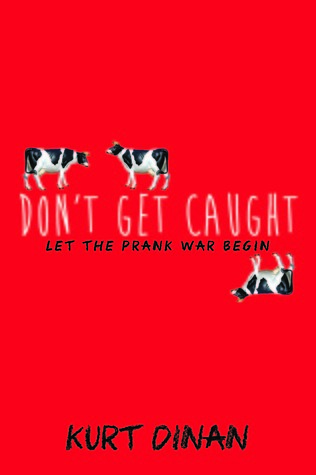 Chapter one gives us Max and four of his classmates, Wheeler, Ellie, Malone, and Adleta, getting framed for a pretty spectacular mega-prank and becoming the laughing stock of their school. But revenge is sweet and this group's got a serious hankering for some sugary payback (sorry...in my head that sounded really cool...). So Max and the others band together and plan a series of pranks to weed out the real criminals, the Chaos Club. Dinan infuses a brilliant layer of humor into his story and weaves in subtle and oftentimes surprising character complexities that keep Don't Get Caught from ever dipping its toes into the waters of stereotypes and tropes. Max becomes our guide through the world of high jinks, larks, and capers, utilizing his list of rules he's created from all of the heist movies he's watched. We get to watch friendships form, loves blossom, secrets revealed. The characters are wonderfully flawed, and even though you cheer them on, you begin to wonder (as they do) if they've begun to cross that line from hero to villain. The end result from all of this is a book absolutely brimming with humor, honesty, and heart. The best part, though, is that even though the action begins early, Dinan gives this story time to breathe. He gives the readers time to breathe. We have time to think and wonder. And most importantly, we have time to appreciate. Which is a good thing, too. Because this book is packed with stuff you're going to fall in love with.